Within each cell, novel proteins are constantly synthesized and folded into their biologically active conformation. At the same time it is of key importance that damaged, malfolded or otherwise dysfunctional proteins are removed from the cellular pool of proteins. Maintenance of protein homeostasis is a complex interplay of often competing pathways that regulate the production, transport, quality control and clearance of proteins. Not surprisingly, an imbalance of protein homeostasis is tightly associated with different devastating human diseases such as Alzheimer’s, Parkinson’s, diabetes and cancer. Proteolysis has emerged as a key mechanism to ensure a proper balance in protein homeostasis. It has been established that damaged or malfolded proteins are proteolytically removed to prevent their toxic aggregation. E. coli has been used as a valuable model organism to study regulated proteolysis. The pioneering genetic experiments of Susan Gottesman unearthed the major E. coli proteases responsible for regulated proteolysis as well as their evolutionarily conserved nature (1). Specifically, she showed that abnormal and misfolded E. coli proteins are removed by energy-dependent proteases mainly belonging to the AAA+ protease family such as Lon, ClpAP, ClpXP, HslUV and FtsH. These proteases are ubiquitously present in all cells and function as “protein-wrecking machines” by performing protein quality control (2). Substrate proteins contain specific peptide sequences (degradation tags or degrons) that ensure recognition by the AAA+ protease. Bacterial degradation tags are typically small and unstructured. Many of the degradation markers are added co- or post-translationally such as the bacterial ssrA tag or eukaryotic ubiquitin. In addition to covalently added tags, also certain amino acids at the N or C-terminius earmark proteins for degradation. In E. coli, aromatic amino acids at the N-terminus (N-end rule) typically destabilize the substrate and are recognized by adaptor proteins that deliver them to the AAA+ protease for degradation. Likewise, C-terminal sequences of five residues rich in nonpolar residues ensure a rapid degradation in E. coli (1, 2). Several ways have been identified by which degradation tags facilitate recognition by the protease: (i) binding to the AAA+ module, (ii) binding to the auxiliary domain, (iii) binding to a specific adaptor protein, which is bound to the protease and (iv) facilitating (covalent) interactions that ascertain binding to the protease. AAA+ proteases function as large oligomers and comprise one or two AAA+ modules as well as an auxiliary and proteolytic domain. Both activities may reside on the same polypeptide or on distinct polypeptides. The auxiliary domain is involved in substrate binding or binding of activity-modulating adaptor proteins. Structurally, the AAA+ modules are organized into a hexameric ring with a central pore, which is attached to a cylindrical-shaped proteolytic chamber comprising 6 or 7 subunits. 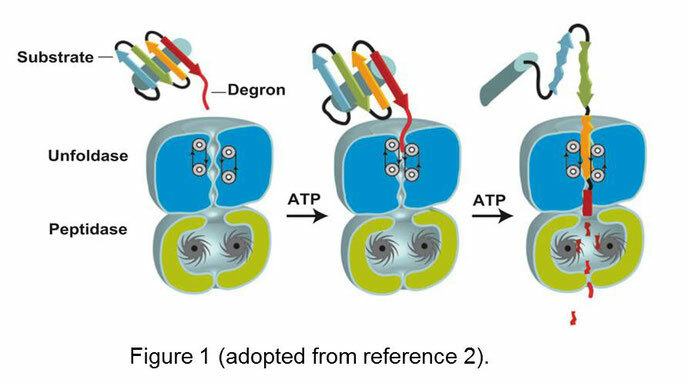 Subsequent cycles of ATP binding and hydrolysis drive the unfolding of attached protein substrates and feed the unfolded polypeptide chain through the central pore into the protease chamber (figure 1). In essence, the AAA+ modules possess unfoldase activity, although not every AAA+ modules displays the same the degree of unfoldase activity. In fact, biochemical evidence suggests that some AAA+ modules are more powerful unfoldases than others. Interestingly, AAA+ proteases are able to degrade proteins from the N or C-terminus as well as from internal sites, suggesting that substrates are fed vectorial into the protease chamber. Here, the protein is degraded and fragments of about 10 residues are released, which are subjected to further degradation by other proteolytic enzymes (2). Here, I will focus on describing the structure-function relationship of bacterial AAA+ proteases such as Lon, the Clp proteolytic machinery, HslUV and FtsH. 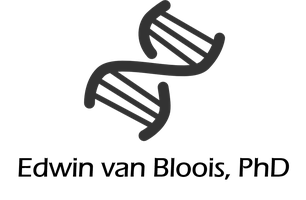 Lon family members are found in all domains of life and are classified as LonA or LonB based on their domain organization. LonA members comprise bacterial and eukaryotic enzymes, whereas LonB proteins are archaeal proteases. LonA and B contain a typical AAA+ module as well as a protease domain located on a single polypeptide. However, LonA contains two additional N-terminal domains (LAN), which are not found in LonB, although this enzyme has a transmembrane domain located in its AAA+ module. In E. coli, Lon is a key component of the protein quality control system by degrading unfolded and other unstable proteins, thereby protecting the cell against their harmful effects (1,2). Despite its critical role, Lon is not essential for viability of E. coli cells, although these cells display a mucoid phenotype (3). Several structures of AAA+ modules, protease domains and other regions of Lon proteases have been presented, offering a fragmented mechanistic view at best. However, recently a novel structure of LonA from Meiothermus taiwanensis bound to ADP was reported (4). This structure represents the core enzyme, comprising its AAA+ module and protease domain and lacks the LAN region. Figure 2 shows a single protomer, which contains the AAA+ module (blue), ADP (red) and protease domain (yellow). The complete enzyme constitutes a hexameric assembly of six protomers (figure 2, each protomer is individually colored) with three ADPs (red). The protomers are, moreover, alternately organized into a nucleotide-free and ADP bound state. LonA employs a Ser-Lys dyad for peptide bond cleavage of substrates. 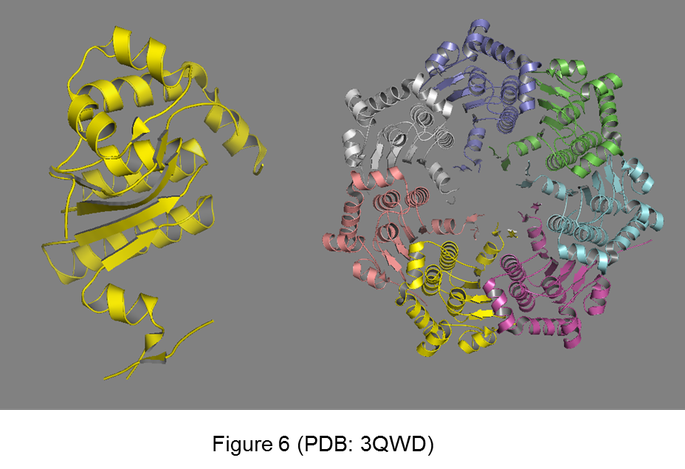 Interestingly, a structural comparison of the proteolytic domain with (green and ADP in red, PDB: 4YPL) or without ADP (yellow, PDB: 5E7S) reveals significant conformational differences as shown in figure 3. This suggests that binding of ADP to the ATPase site of AAA+ module induces structural movements in the enzyme that drive substrate unfolding, translocation and degradation and possibly allosteric stimulation of ATPase activity (4). Members of the Clp (caseinolytic protease) family are ubiquitously present in bacteria and eukaryotic organelles such as chloroplasts, mitochondria and peroxisomes. Unlike Lon, the unfoldase and protease activities of the Clp system are located on two different subunits, which are organized as separate multimeric components (1,2). Specifically, a ring-shaped hexameric ATP-dependent unfoldase and a barrel-shaped protease, which comprises two stacked heptameric rings. In E. coli, ClpA and ClpX function as independent unfoldases and cooperate with the protease core (ClpP), yielding ClpAP or ClpXP. ClpA and X bind substrate proteins and associate with ClpP, facilitating the disassembly, unfolding and translocation of substrate proteins into ClpP. Structurally, ClpA (figure 4; PDB 1R6B) is organized into an N-terminal domain (green) and two AAA+ domains (blue and yellow). The AAA+ modules consist of a large and small subdomain, containing the nucleotide-binding site (ADP is in red) (5). In the presence of ATP, ClpA forms a hexamer which represents its biologically active form and associates with ClpP. ClpA and X are highly similar, although ClpX is much smaller than ClpA (47kDa vs 83kDa). 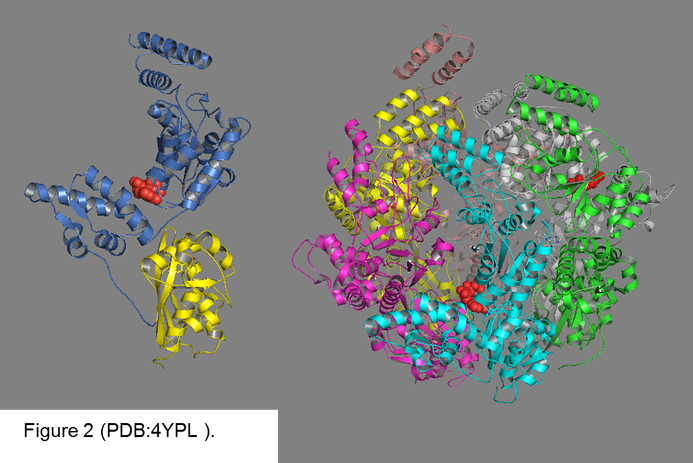 Each ClpX subunit (figure 4; PDB 3HWS) comprises an N-terminal domain and one AAA+ module (green), organized into a large and small subdomain with the ATP-binding site (ADP in red) as well as a C-terminal domain (blue) (6). ClipX subunits assemble into a hexamer, which represents the functional unit. Interestingly, a hexamer is still formed (figure 4) when the individual subunits lack the N-domain. The hexameric ClpX ring associates with ClpP. The N-domain of ClpA and X is involved in binding of substrate proteins, adaptors and mediates hexamer stability. Adaptor proteins target specific protein substrates to the unfoldase unit of AAA+ proteases. E. coli ClpS represents one of the best studied adaptor proteins. It is a monomeric protein of 12kDa and delivers substrates with an exposed N-terminal destabilizing amino acid (N-end rule) to ClpA through association with the N-domain of ClpA. Elucidation of the ClpX structure with several N-end rule peptides (figure 5; PDB 2W9R, the model peptide LVKSKATNLLY is shown in blue) revealed a binding pocket optimized for substrates containing an N-terminal Phe, Leu and possibly Phe (7). In addition, evidence is accumulating that adaptors are also involved in modulating the activity of AAA+ proteases (2). E. coli mutants of clpP are viable and do not display any obvious phenotype, suggesting the existence of complementary proteolytic mechanisms. However, many unstable proteins are stabilized in these mutants, indicating that in vivo ClpP plays a key role in protein quality control (3). It has been established that ClpP is cylindrical serine protease responsible for degrading malfolded, damaged and regulatory proteins. Several crystal structures of ClpP from different bacteria have been reported, including Staphyloccocus Aureus (8). This structure (figure 6, PDB 3QWD) shows that the functional enzyme comprises 7 subunits (monomer in yellow), which are organized in two stacked heptameric rings. These make up a protease chamber with 14 active sites and two axial pores through which substrates are feeded into the enzyme. ClpP employs a His-Asp-Ser catalytic triad for peptide bond hydrolysis. Substrates are degraded processively into fragments of 6 to 8 residues which are expelled from the protease through pores in the wall of the proteolytic chamber. These are transiently formed by conformational changes without dissociation of the barrel (8). The HslUV proteolytic system represents an additional two-component protease with HslU (ClpY) functioning as a AAA+ unfoldase and HslV ClpQ) as peptidase. Prokaryotic HslUV is homologous to the eukaryotic proteasome and is induced by heat shock and other stresses including DNA damage (1,2). The enzyme degrades unstable and regulatory proteins similar to LonA. E. coli cells devoid of HslUV are viable and are weakly temperature sensitive for growth (3). Overexpression of this protease in E. coli cells that lack LonA suppresses their mucoid phenotype, suggesting that HslUV serves as a backup for LonA (9). Several structures of prokaryotic HslUV enzymes have been presented, including the E. coli variant (figure 8). 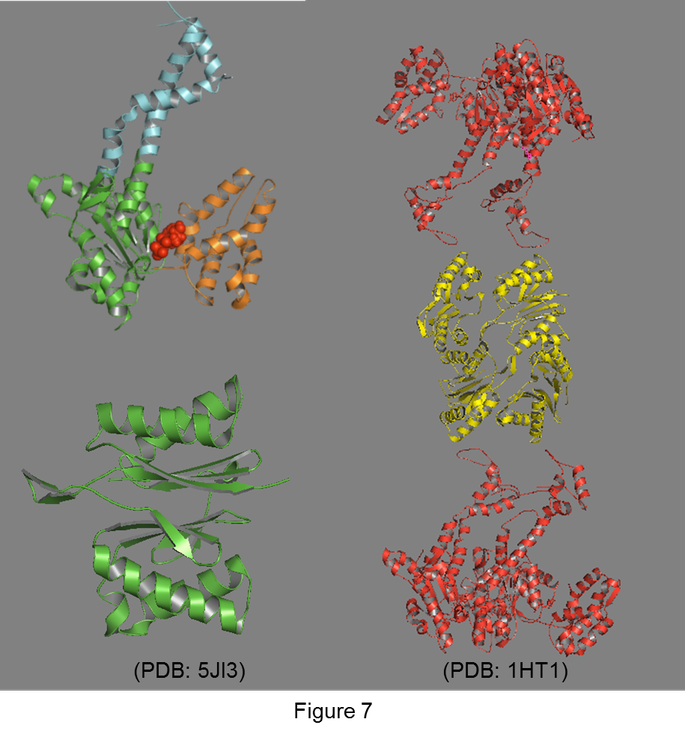 These structures reveal that HslU (PDB 5JI3) comprises an N-domain (in green), intermediate domain (blue) and a C-domain (orange). The ATP-binding site is located on the N-domain (ADP is in red). The intermediate domain has been implicated in substrate binding, while the C-domain is required for the association with HslV (10). 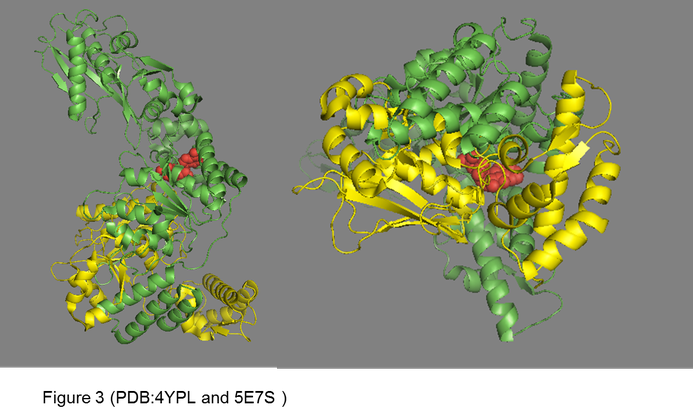 The enzyme is functional as a large multimeric complex, comprising two hexameric HslU rings (in red) that are associated with a double hexameric HslV barrel (in yellow, PDB 1HT1)(11). 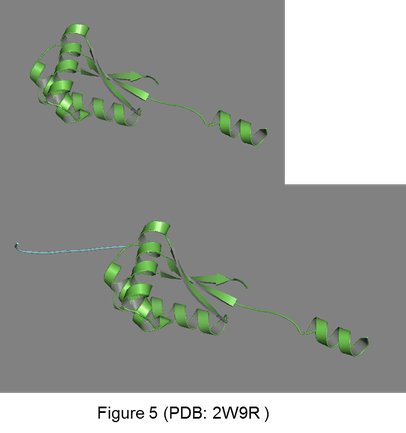 A single HslV subunit is shown in green (PDB 5JI3). Substrates are bound at the outer face of the HslU ring, unfolded and fed through the axial pore in to the HslV protease chamber for degradation (2). Substrate selection by HslU is not fully understood but it seems that binding of different recognition tags at multiple binding sites controls substrate selection (10). Peptide bond cleavage is catalyzed by active site Thr residues of HslV. FtsH is a metalloprotease of the AAA+ class that is universally conserved in prokaryotes and eukaryotic organelles such as mitochondria and chloroplasts. The unfoldase and protease activity are located on a single polypeptide in the cytosol, while the complete enzyme is anchored into the cell membrane via two N-terminal transmembrane domains. In E. coli, FtsH is the only AAA+ protease that is essential for viability (1,3) and is required for the quality control of misassembled membrane proteins as well as the turnover of cytosolic regulatory proteins. Several structures of prokaryotic FtsH enzymes or its domains have been reported. For example, structures of truncated FtsH from Aquifex aeolicus, lacking the N-terminal transmembrane domains were solved bound with ADP and/or Zn (figure 8). These structures, therefore, comprise the AAA+ module and protease domain. 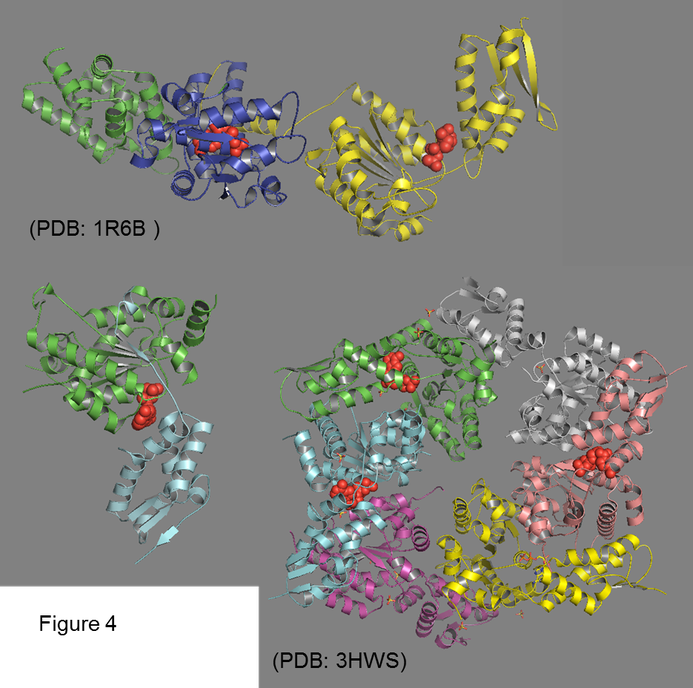 A single subunit is shown in figure 8 (PDB 4WWO) with the unfoldase unit in yellow bound to ADP (purple) and the peptidase in red, containing zinc (green) (12). 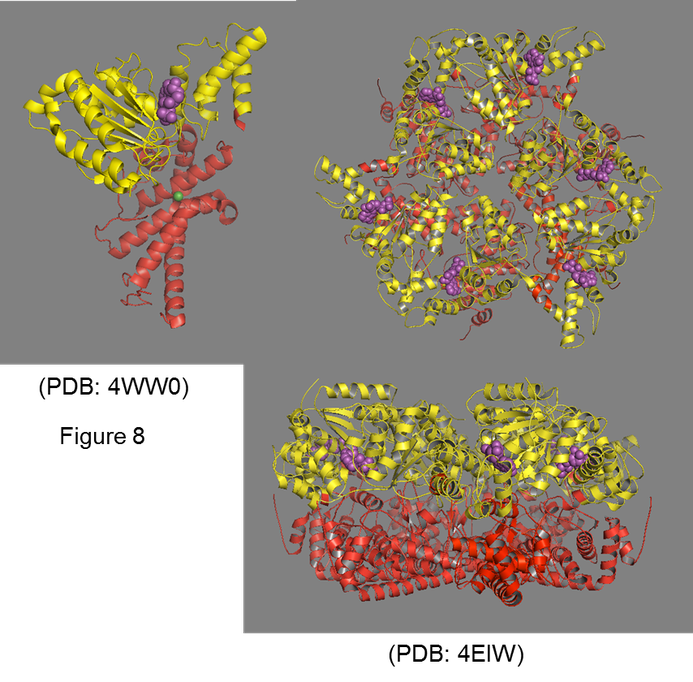 FtsH is functional as a large multimeric complex (PDB 4EIW), comprising a homohexameric ring structure with AAA+ modules (yellow) stacked onto the protease chamber (red). Interestingly, each protomer is bound to ADP (purple) (13). The protease chamber is accessible via a central pore through AAA+ modules. How substrates are selected, unfolded and degraded by FtsH is not fully understood, although it is assumed that FtsH uses its AAA+ module to unfold and translocate substrates into the protease chamber were they are subsequently degraded. The protease domain contains a zinc-binding sequence (HEXXH), indicating that FtsH is a zinc metalloprotease. Evidence has been presented that E. coli FtsH forms a large multimeric complex of about 1000 kDa with HflK and HflC, two other membrane proteins (14). These have been implicated in modulating the activity of FtsH. Regulated proteolysis is an established mechanism to safeguard a proper balance in protein homeostasis, thereby preventing the cell against the toxic accumulation of abnormal and malfolded proteins. It’s easy to understand that a small disturbance of this delicate balance may have dire consequences as it often results in devastating human diseases such as Alzheimers’s, Parkinson’s, diabetes and cancer. The Gram-negative bacterium E. coli is valuable model organism to understand the players and mechanistic aspects of regulated proteolysis. The pioneering work of Susan Gottesman and co-workers established that in E. coli AAA+ proteases are key in regulated proteolysis. Specifically, LonA, ClpAP, ClpXP, HslUV and FtsH are responsible for protein turnover and controlling protein homeostasis. Moreover, these enzymes are evolutionarily well conserved because homologous have been identified in prokaryotes and eukaryotic organelles such as chloroplasts and mitochondria. An increased understanding about regulated proteolysis is also biotechnologically relevant because many heterologously expressed proteins in E. coli are unstable and therefore degradation-prone. However, recombinant proteins can often be stably produced in E. coli cells devoid of major AAA+ proteases such as Lon, ClpAP or ClpXP (15). Although the key players are known, the molecular details of regulated proteolysis are not fully understood. It can be expected that more structures of AAA+ proteases preferably with ligands shed more light on how these “protein-wrecking machnines” function. Moreover, recent proteomic studies have provided insight into the substrate scope of different prokaryotic components of the proteolytic Clp machinery (16,17). The results of these studies emphasize the power of this proteomics approach to delineate their full set of target proteins, thereby further increasing our understanding of AAA+ proteases. 1. Gottesman, S. 1996. Proteases and their targets in Escherichia coli. Annu Rev Genet. 30: 465-506. 2. Sauer, R.T, Baker, T.A. 2011. AAA+ proteases: ATP-fueled machines of protein destruction. Annu Rev Biochem. 80: 587-612. 3. Gottesman, S. 1989. Genetics of proteolysis in Escherichia coli. Annu Rev Genet. 23: 163-198. 4. Lin, C.-C. et al. 2016. Structural Insights into the Allosteric Operation of the Lon AAA+ Protease. Structure 24: 667-675. 5. Xia, D. et al. 2004. Crystallographic investigation of peptide binding sites in the N-domain of the ClpA chaperone. J.Struct.Biol. 146: 166-179. 6. Glynn, S.E. et al. 2009. Structures of asymmetric ClpX hexamers reveal nucleotide-dependent motions in a AAA+ protein-unfolding machine. Cell. 139: 744-756. 7. Schuenemann, V.J. et al. 2009. Structural Basis of N-End Rule Substrate Recognition in Escherichia Coli by the ClpAP Adaptor Protein Clps. Embo Rep. 10: 508-514. 8. Geiger, S.R. et al. 2011. A Conformational Switch Underlies ClpP Protease Function. Angew.Chem.Int.Ed.Engl. 50: 5749-5752. 9. Wu, W.F. et al. 1999. Redundant in vivo proteolytic activities of Escherichia coli Lon and the ClpYQ (HslUV) protease. J Bacteriol. 181: 3681-3687. 10. Baytshtok, V. et al. 2016. A Structurally Dynamic Region of the HslU Intermediate Domain Controls Protein Degradation and ATP Hydrolysis. Structure 24: 1766-1777. 11. Wang, J. et al. 2001. Nucleotide-dependent conformational changes in a protease-associated ATPase HsIU. Structure 9: 1107-1116. 12. Vostrukhina, M. et al. 2015. The structure of Aquifex aeolicus FtsH in the ADP-bound state reveals a C2-symmetric hexamer. Acta Crystallogr.,Sect.D 71: 1307-1318. 13. Suno, R. et al. 2006. Structure of the whole cytosolic region of ATP-dependent protease FtsH. Mol.Cell 22: 575-585. 14. Saikawa, N.J. et al. 2004. FtsH exists as an exceptionally large complex containing HflKC in the plasma membrane of Escherichia coli. Struct Biol. 146: 123-129. 15. Baneyx, F. 1999. Recombinant protein expression in Escherichia coli. Curr Opin Biotechnol. 10: 411-421. 16. Feng, J. et al. 2013. Trapping and proteomic identification of cellular substrates of the ClpP protease in Staphylococcus aureus. J Proteome Res. 12: 547-558. 17. Graham, J.W. et al. 2013. Trapping and identification of cellular substrates of the Staphylococcus aureus ClpC chaperone. J Bacteriol. 195: 4506-4516.